Join us at our ranch, located about 25 minutes from Cabo San Lucas, for a fantastic ride on the beach as the sun sets over the beautiful waters of the Pacific Ocean. Ride along remote dirt roads through wild desert scenery to the vast expanses of beautiful Migrino Beach. Once on the beach, enjoy the cool mist of the ocean spray cooling you off as the sunset begins on the horizon, casting brilliant colors into the air over the ocean. A truly enchanting experience. Pick-up from your Cabo San Lucas Hotel or Cruise Ship. 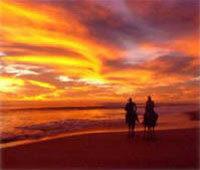 Pick-ups also from San Jose del Cabo and the Los Cabos Corridor. Ages 4 and up. Must have a valid drivers license to drive. Kids same price as adults. Maximum weight is 85 years old. Pregnant women or people with back injuries or chronic back pain can not participate in this tour. Clients with disabilities are permitted as long as they can mount and dismount with assistance and have collapsible wheelchair for transportation. Weight Limit per horse is 353lbs (160 kg). 1. Make sure to put on sunblock! Even though this is a sunset ride, the sun is still strong when the tour starts. 2. Make sure to wear long pants - you'll be raw on the inside of your legs if you wear shorts.